Scott & Co was established in 1997 by David and Dolly Scott. The practice has developed upon a sure foundation and expertise which has been constantly evolving since David first came to work in Cornwall in 1981. Chris Hunter joined the practice in 2001. He is now running projects on his own and expanding the client base. The qualified surveyors are backed up by an enthusiastic team in Lemon Villas. The practice primarily concentrates upon Historic Building Consultancy, although we also advise on modern buildings and design, new homes and structures. We generally restrict our practice to Cornwall and the Isles of Scilly, wanting to be accessible to any building project that we administer. This ensures knowledge of local vernacular along with a good relationship with statutory bodies and contractors. The majority of our clients request our help from inception to completion. We assess the building, advise on works, design, specify and administer the project on site to completion. 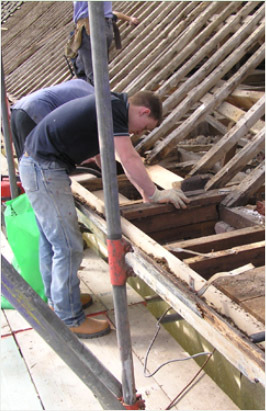 We are also commissioned for one off surveys or condition reports. We advise in litigation and act as expert witnesses. Our aim is to work with our clients to ensure that they get the advice and service that they need. David Scott BSc Dip Bldg Cons FRICS is a fellow of the RICS, has a post graduate diploma in Building Conservation and is one of the few accredited Conservation Practitioners in Cornwall. Two of his projects have won Conservation Awards in the highly acclaimed international RICS Conservation Awards and he personally has won the people in conservation award from the RICS. He occasionally lectures for SPAB. He is a member of the Ecclesiastical Architects and Surveyors Association.